Ah, spring. Tulips, chocolate bunnies, and…. capitalist conspiracy. Each spring the shareholders of every major bank get together to make their strategic plans for the year. Bank of America will meet in Charlotte, NC. Wells Fargo’s meeting is at their headquarters in San Francisco’s financial district. What’s on their agenda? Plain and simple: profiting at the expense of our communities. I can just picture it: a guy in an expensive suit presenting a power point to a conference table full of other people in expensive suits, taking notes on their Ipads. First slide: (Bar Graph) Predatory loans were AWESOME! Lets make sure we follow through, and foreclose all those people out of their homes! There must be at least 3 houses left in East Oakland that we haven’t taken…let’s get in there! Second slide: (Politician shaking hands with John Stumpf) Keep those wheels greased! Lets have the best democracy money can buy, and make sure the cities of Oakland & San Francisco keep investing all their money with us, letting us do whatever we want with it. Third slide: (Twenty-somethings with backpacks on) Invest in America’s youth! With skyrocketing tuition, all we have to do is hook them young and they’ll be paying us for the rest of their lives! Incidentally, we should invest in Ramen noodles, because they will also have to live on those for the rest of their lives with the rates we’re charging. Fourth slide: (Prison cell) We can’t afford to ignore the 2 million people in jails and prisons, or the 12 million people who are undocumented, can we? Investing in the GEO group gives us a way to make profit every time an immigrant is detained, and every time someone goes to a private prison. It’s genius. Fifth slide: (IRS form) You may be asking yourself “Hey! If we make ka-billions in profit, won’t we have to pay a lot of taxes?” Worry not. Between our tax lawyers and spineless legislators it’s no contest. We paid NO TAXES AT ALL last year! Ok, ok. So maybe it’s not exactly a scene from South Park. But it’s pretty close. Every major bank holds its shareholder meeting in the spring, making their nefarious plans about how to invest the billions they have stolen from us: ranging from mineral extraction in the global south to foreclosures in East Oakland. But 2012 will be different than last spring, and the spring before it. 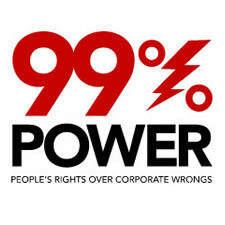 This year, there’s a nationally coordinated effort of the 99% to fight back (//www.the99power.org/). We may not have the money for our own strategy meetings in fancy boardrooms, but we have something much better: people power; the millions of people who are fighting to save their homes, struggling to pay their bills, and ready to take action to make things better. We have been preparing for this with a series of trainings (//the99spring.com/) to ground people in a moral framework, political critique, and in the concrete skills of non-violent direct action. We have been building a new and more collaborative relationship between labor unions, community groups, and activist formations. These relationships are new, and we face the challenge of having different priorities, different constituencies, and often vastly different political cultures. But, the scale of the crisis we are facing is so huge, that we must build convergence despite our differences. We are far from ready for the scale of work we have decided to do, but we are going to do it anyway, because history is calling. At Causa Justa :: Just Cause, we have been targeting Wells Fargo and protesting their shareholder meetings for more than 3 years in campaign to win a moratorium on foreclosures and evictions, divestment from private prisons and immigrant detention, and an end to predatory lending. We have also been pressuring the cities of Oakland and San Francisco to divest from Wells Fargo and instead create municipal banks by and for the people who live in the city. This work took on a new life and a new shape at the end of last year, when we worked in groundbreaking collaborations with Occupy SF & Occupy Oakland activists, with unions, and with grassroots organizations, giving Wells Fargo a taste of what it will look like when the 99% act as one. Their headquarters were shut down by civil disobedience half a dozen times, taxpayers sued them, and even their own employees whispered complaints about family members in foreclosure. 2012 will bring a whole new level of pressure onto Wells Fargo. The momentum that has been building for years in directly impacted communities, like the Black and Latino families that lead Causa Justa :: Just Cause, is spreading far and wide. The hope that a politician will make change for us has fallen away, and in it’s place there is a new narrative of change: that the people themselves, the 99%, will take history into our own hands, and shape a better future. We are tired of negotiations that produce nothing, tired of “being heard” by CEOs, while they continue to ravage our communities. This year, the 99% will hold a stakeholders meeting, and not allow the shareholders of Wells Fargo to meet at all. 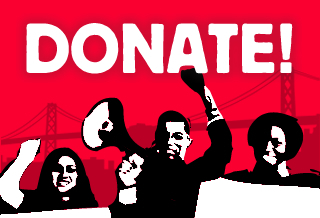 This year, the SF Bay Area will mobilize in coordination with cities across the country, for a whole spring season of mobilization and direct action. This year, we will make history. Join us, April 24th in San Francisco: //www.cjjc.org/en/news/63-occupy/274-join-us-april-24-for-non-violent-protest-in-sf.